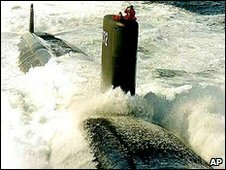 The US defence department has decided to allow women to serve aboard submarines, according to officials. Defence Secretary Robert Gates has approved the recommendation and sent letters to Congress informing them of the plan. Congress now has 30 days to approve the measure. The move comes as the US Army's chief of staff said it was time to revisit rules restricting women in combat roles. Women are still barred from traditional frontline roles in the armed forces. General George Casey told Congress on Tuesday that he supports a reconsideration of the role of women in combat. "I believe it's time that we take a look at what women are actually doing in Iraq and Afghanistan. And then we look at our policies," he said. Fifteen per cent of the US Navy personnel are female, and women have worked alongside men on surface ships and aircraft since 1993. It was thought the very cramped conditions in submarines precluded both sexes working together. It is expected it will take a year before the first women can be trained for American submarine duties. The vessels will also need to be modified to give men and women separate quarters.